Todd Rundgren is kind of like a Mensa member who gets inadvertently enrolled in remedial math. His expertise in the studio is so copious and his musical styles so varied that creating a pop or rock record has sometimes made him sound artistically stifled, sporadic, or flat-out bored. While he’s demonstrated time and again that he can dabble in various genres (and often on the same album), his more resonant work has resulted from a cohesive and concentrated approach. Rundgren does just that on his latest effort, Arena, on which he delivers the kind of streamlined progressive rock suggested by its title. Brazen, swift blasts of electric guitars are ubiquitous, punctuated by meaty riffs and fist-pumping choruses. There’s also a palpable element of cheek at play here—if not downright cockiness—but Rundgren (ever the showman) pulls it off. As he has wont to do in the past, Rundgren assumes the role of a one-man band, playing every instrument and programming all computerized simulations. To his credit and to the album’s overall advantage, the synthesized aspects don’t overtake or impede the robust velocity of the music. Certainly, on vitriolic tracks like “Mountaintop” and “Strike,” Rundgren wields more power chords than Pro Tools. 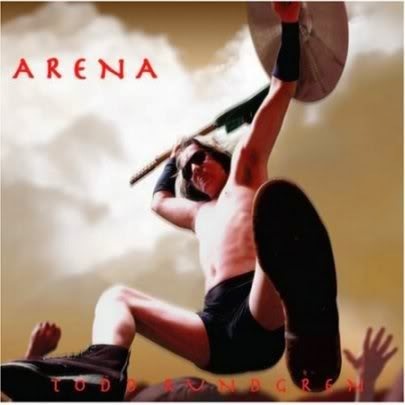 Even if Arena is but one of Rundgren’s arbitrary sonic experiments, he at least follows it through with focus, consistency, and no shortage of testosterone. In a nutshell, he’s succeeded here with something, which sure beats getting by with anything.